Standard 1" wide bands. Loop diameter .375 / .125 slot. Measure your brake drum before ordering. The Part #4316, 4" band fits 4-3/16" brake drums and are used on Yerf Dog Go Karts, Kartco Go Karts, ThunderKarts, Ken-Bar Go Karts and many other brands with 4-3/16" brake drums. The 5" brake bands are used on Carter Brothers Go Karts with 4-3/4" drums. The 6" Comet Band VIN0941 will NOT work on Yerf Dog Go Karts with a 6" brake drum. The 1036 has half moon shaped retainer arms that keep it from slipping off the drum. It's 1" wide and fits 4-3/16" OD brake drums. Super popular band used on most Single Wheel Pull Manco Go Karts. Genuine Factory Part. 2" Center Hole, 1" Wide. 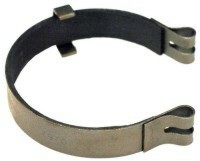 Use with 4" Brake Band 4316 or 1036. It has (4) 5/16" Bolt Holes on a 2-13/16" Bolt Hole Circle and (4) 3/8" Bolt Holes on a 2-7/8" Bolt Hole Circle. Uses 5" Brake Band 04-10312. 4-3/4" HEAVY DUTY, Steel Brake Drum for Carter Brothers Go Karts. 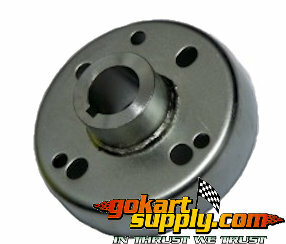 Has (4) 3/8" Bolt Holes on a 3-3/32" Bolt Hole Circle for Carter Karts. It also has (4) 3/8" Bolt Holes on a 2-7/8" Bolt Hole Circle, to fit even more brands. 2" Center Hole, 1" Wide. These have a squared off style retainer that keeps the band from slipping off the drum. Best for "live axle" applications because of the length of the retainer arms. The Band is 1" wide and fits 4-3/16" OD drums. Used on Live Axle Brake Drum 115587. If the retainer arms get in the way, trim them down or cut them off with a saw. 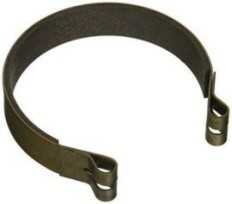 Brake Band To Frame: Locate the brake stud which is welded to the rear left side of the engine base in many cases. Slide the bottom end of the brake band onto the brake stud and insert a cotter pin through the slot of the brake band and the hole of the brake stud. The head of the cotter pin should be toward the rear of the frame. Separate the prongs of the cotter pin and bend them backward. Ensure that the brake band is securely fastened to the brake stud. If your kart uses a brake band with retaining arms such as Brake Band #04-9195 or #1036 (pictured above) then orient the retaining arms toward the top. 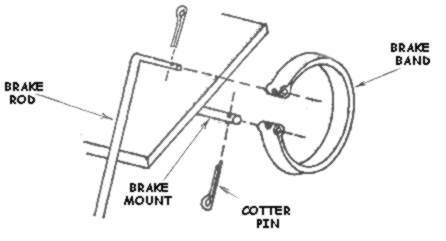 Brake Band To Rod: Some brake rods are bent on the end like the one shown in the illustration. Other go karts and mini bikes are equipped with a straight brake rod that has no bent end to connect the rod to the brake band so you have to use a Clevis Pin (Part #9118 shown below) to connect the band to the rod. Align the end hole of the brake rod with the loop in the brake band making sure the brake rod is positioned in the slot of the brake band. Place one flat washer on the clevis pin and slide it completely through the brake band and brake rod. Place the cotter pin through the hole of the clevis pin. Separate the prongs of the cotter pin and bend them backward. It's important to test the brakes at this time. Fully apply the brake and try to rotate the drive wheel. The drive wheel must not turn with the brake applied. 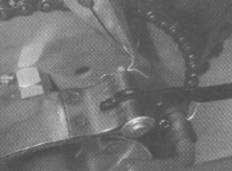 Brake Band and Straight Rod Application: This is an example of an application using a straight ended brake rod with a brake band, clevis pin, washer and cotter pins. The brake band set up shown is a Manco single wheel pull go kart but this method is considered to be universally proper. If the brake doesn't stop the kart as required, you probably need to adjust the brake rod itself. Brake Rod Adjustment: The brake rod should be adjusted, Effectively Shortened if the brake pad does not press hard enough to stop the vehicle. To adjust the brake, shorten the brake rod by removing the fastener through it's forward end, then reassemble the connection by using the next hole toward the rear. WARNING - Do not overtighten the fasteners, the pedal must be able to move freely. Additional adjustment can be made in a similar manner to vehicles equipped with Scrub Brakes which are Brake Paddles that rub your back wheels to a stop. They can also be adjusted at the rear of the brake rod where it attaches to the brake lever. WARNING - Ensure proper fasteners in good condition are installed throughout the brake system. Failure of these fasteners may cause brakes to fail. Band Brakes are simple, effective and economical for a variety of light duty vehicles. Coated Steel Band with a two-piece Bonded Brake Lining. Pin included. 3/8" x 1" Brake Band Pin used to hook up brake cables to a horseshoe shaped brake band. It clamps to the innerwire of the cable with a set screw that's included. 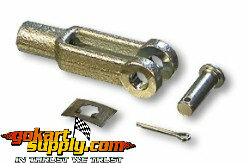 2-1/4" Clevis, 3/4" Clevis Pin, 1/16" x 1/2" Cotter Pin. This is a 4-1/4" x 2-5/8" Brake Shoe rubs against the tire. Used on early mini bikes and go karts. The factories later replaced this old school brake style with a horseshoe shaped brake band that wraps around a brake drum. The brake drum bolts up right next to the drive sprocket on the back wheel.